1 registered members (Scott35), 8 guests, and 16 spiders. I dont know how it is fastened,there are more pictures to go w/ this. Its David copperfield at work!!! Am I imagining things or do I see three services to a residential building?!? Its not a resi. building, its a former 2 room church school,the POCO is PG&E. And they continue on through knobs and tubes, eh? In the upper of these two photos, there's a loose romex at the left. I'd hate to see that bare ground get bumped over onto the bus bars. Why was Zinsco so popular in California (and other western states???) Was there a manufacturing facility there? Do my old eyes decieve me, or has someone snipped some of the wires, ( red/black) in pic 4 in order to get them to fit? If you look at a old (pre GTE Sylvania)Zinsco,it will say "Zinsco Electrical Products Los Angeles Calif."and one of those really old clay pigeon substitutes,will say "Magnetrip". P.S. I suspect they had more national distribution after GTE bought them in the 1970s. They were very popular in apartment buildings,trailers and other structures wired by bottom feeders. Kinda ironic...using the term "bottom feeders" when referring to Zinsco. The best thing about that Zinsco Panel is: The plaster job that surrounds it. This guy cared enough to insatll metal chanel around it so he wouldnt' plaster the door shut with the new finish depth. So, what would have been the good choice for a panel like this in the '60s? Remember. at that time they didn't know what we know now about these problems. Best service in the 1960-70s IMO would be I-T-E,Cutler-Hammer,and SQ D*. * Around here SQ D would be a BAD choice since no local support, but their resi. equipment was well built. Cutler Hammer would have been a non-choice in the '60s. The type CH/CHB breakers weren't introduced until about '72 or '73 Even then, they were considered by many as too new to be trusted. Sort of narrows down the field, huh? The "CH" was introduced in the late 50's, the time the "CHB" came on the market I dunno. That panel is a Murray in the 2nd pic. Is there anyone on board who knows how to fly a plane? Turns out my father worked at Federal Pacific in Newark NJ way back in the early 50's as an accountant. He was building our house back then, and he used FPE panels for subpanels. One was a stab-lok panel, which has since been replaced by a Square D. I doubt that my father knew of any issues with stab-loks back then, as he wanted quality stuff for his house. The meter pedestal that serves the townhouse I own is made by Zinsco (in Fredericksburg, VA). It's in the utility right-of-way and has electric meters for 5 houses in it. I'm pretty sure it's the power company's problem. They (Dominion Power) disclaimed any responsibility for it but after I got off the phone with them telling them that many of those meter pedestals/enclosures are in poor condition with missing lids and locks etc. which could allow contact to the buss bars for someone who wasn't careful, they came by and fixed all of them. Or maybe that was just a total coincidence and they were going to do it anyway..
Zinsco was quite popular in Florida as well. Alot of houses near where I lived had these installed, including Zinsco MAIN discos and meter enclosures. Where do you live in Fred Vegas? I live in the Salem Fields area and commute to Lorton. My best friend is an operations manager for Dominion and he has told me about those Zinsco pedestals. I saw them years ago in Springfield, but VEPCO at the time took most of them out. If they are giving you a hard time, let me know and I can pull a few strings. PM me over at Tech Talk if interested. Back to the matter at hand, we rarely see FPE or Zinsco around here. I used to work for a service company and we were required to keep basically every size and brand of breakers on the truck. I can honestly say that in four years, I only encounterd a dozen Zinsco panels but plenty of FPE's. Seems like most are gone now. I do have a question about the first pic though. Does the mast go inside the wall for the right-hand service? That would never fly around here, not to mention a flush-mount meter base. 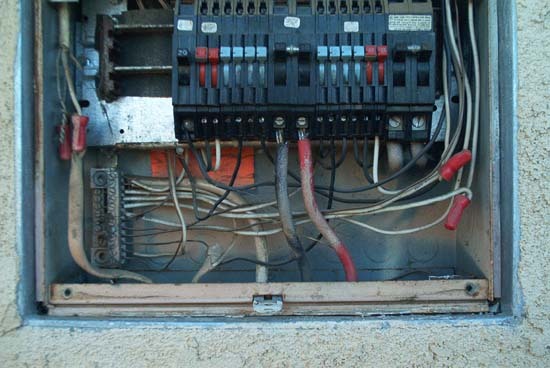 An outdoor panel is almost never done unless there's no other choice and still never integrated with the meter base. POCO gives us the meter base; we supply our own panel and the conduit/cable to connect them. They do the upper half (SE cable and drop) or the lower half on underground (conduit). I guess we have it made here. Have never seen SE cable as being allowed in the PG&E Greenbook. It's the complete opposite here; you really only see masts for services if the building isn't tall enough to maintain clearance. It's perfectly acceptable here to attach the drop to the building if clearances can be maintained. Then again, most services here are underground, at least for the past 40 years or so. I guess the mast requirement in California has something to do with earthquake issues? I actually live in Manassas, Va--the townhouse in Fredericksburg,Va is in Olde Greenwich. I rent it out to my brother. Interesting that VEPCO saw fit to get rid of those awful pedestals in Springfield but not in Fredericksburg. What did they end up replacing them with? I looked on a number of websites and it doesn't appear that anyone makes a multi-meter pedestal like that anymore. They're in really bad shape, being over 30 years old. Let's just say that the meter seal did not need to be cut in order to remove the meter to turn off the power to do my panel upgrade!!! ...most services here are underground, at least for the past 40 years or so. I guess the mast requirement in California has something to do with earthquake issues? Overhead service in SoCA is pretty much limited to existing urban areas and rural areas. Anything in a new area is underground. Utilities are in a continuous process of replacing OH sytems and putting them UG. Even a OH service replacement in most areas will be required to have the capability for future underground feed, or might be required to change from OH to a UG lateral to an existing pole. The idea is to NOT do what was done in a couple of areas in the mid/late '70s, when UG started to become the norm. Our conditions and history are different here than in most other areas. We don't have the issues of ice on OH lines, and lightning is a rarity. OH utilities and service were a natural for us when the place built up like a wildfire. Nobody really realized the magnitude of what was to come. By the time the smoke cleared, there was an OH infrastructure. Great, until someone looked up. Putting the power and other utilities UG in OH districts is more a matter (besides funding) of disruption to roads and the like than the physical relocation itself. The effect is somewhat like putting a shovel into an anthill. 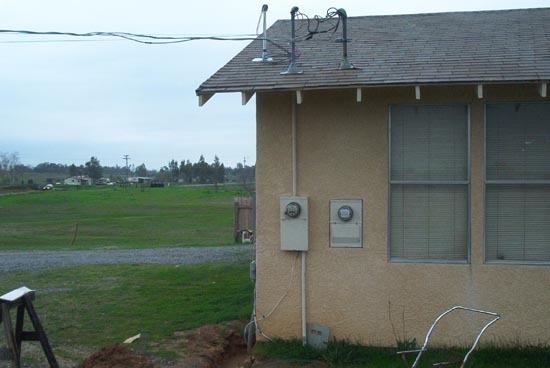 There's no heaves or frost line to contend with, so minimum cover requirements up to 35KV can be as little as 30". I've seen a lot of those "flying gutters" to convert the OH to UG. I've also seen the remains of a few buildings (and services) when the top of that gutter rots off or is left off..and a bit of rain and watch the fireworks begin!! Is this still an approved method of OH to UG conversion. And are you still allowed to have partially recessed meter pans/stacks?? I haven't seen one done like this since I took the photo, so I don't know the answer. It would fall under the POCO's rules. It was fairly common during the '70s and early 80's, but just in a few areas. 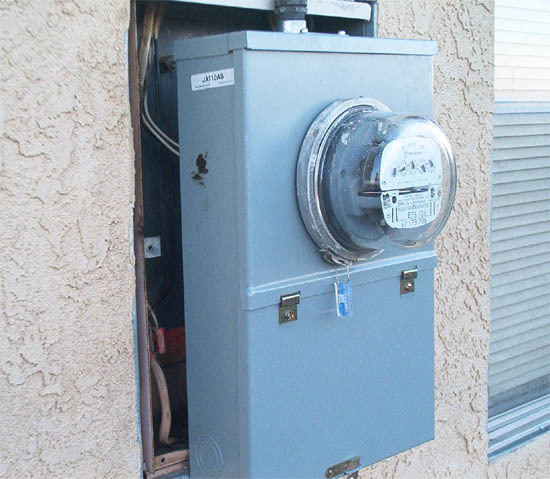 The semi-flush (partially recessed) meters, and panel boards are the norm here. There are nailing flanges meant to be nailed directly to the studs. The photo is of a combination Meter, Main, and Panelboard. Yes, we have have the service masts run through the structure. They are usually GRC or IMC, occasionally EMT. SE cable is unheard of here. I've personally never seen a piece of it. I believe that most EC's around here used what ever they could to keep the costs down and win the bids. I've only seen Wadsworth panels twice, and once was on a cabin Big Bear, CA wayyy up in the mountains. I found it after we inadvertently plugged 2 space heaters into the same circuit. Breaker never tripped, but made a hell of a buzzing sound after a while. Bulldog/Pushmatic is fairly common around CA in installs from the 50's/60's (The house I grew up in had Pushmatics and was built in 1958). The current house in NH has a Pushmatic breaker panel. I believe they are fairly prevalent around here in the older structures. 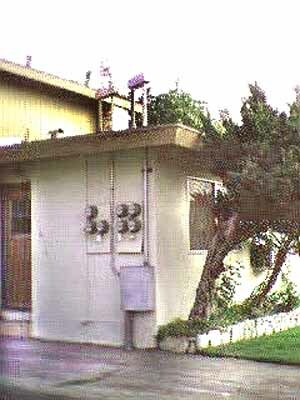 You also see a number of dual meters on single family houses. I believe these are leftovers from Day/Night services. 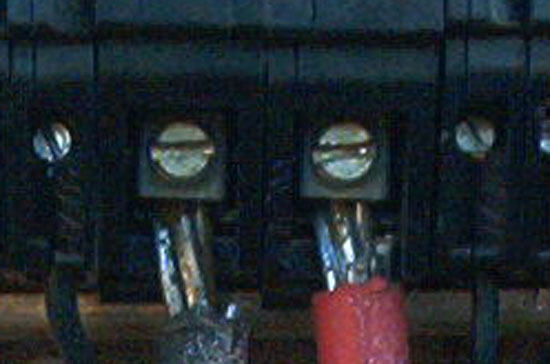 The second meter socket is usually blanked off. There are still a few SFDs that have the two meter setup, from way back. Some were setup for off peak electric water heaters. All that I have seen, the second meter pan is blanked off. Next time I come upon one, I'll get a pic.